The story of Carmichael evolved from a Community Services initiative. The “project” was established in 1988 thanks to the spirit and tenacity of its members and the hard work of visionary and committed public officials in Dublin Corporation and the Eastern Health Board who worked tirelessly and bravely to help make Carmichael a reality. The inspiration for the project emerged following a visit by Liam Clare, Community Development Officer Dublin Corporation to an Enterprise Centre in Terenure in 1985. Here a group of ‘one-person industries’ occupied a few square meters of working space and shared the overhead costs. It occurred to Liam that a similar facility would also serve the needs of representative groups and community and voluntary agencies in the city including arts, sports, environmental, social, and youth organisations. In May 1987 a building to the rear of Christchurch Place was secured for this purpose and it became the home of 18 voluntary organisations. The enabling of many small city-wide individual groups to secure permanent offices by providing shared facilities with shared costs was seen as a great opportunity for supporting their development as service providers. Unfortunately, shortly afterwards the project was served with notice to leave Christchurch Place as the site had been sold by the Corporation for development. A search for a new home for the project commenced. 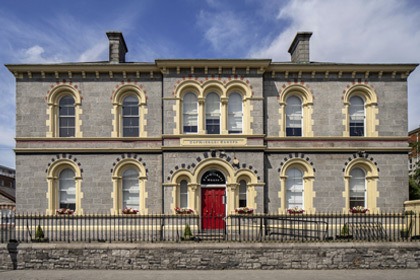 In December 1988, a premises at 4 North Brunswick Street known as ‘Doctor’s Residence’, Richmond Hospital was shown to the project’s Management Committee who agreed it would be a suitable premises. However, the transfer to the building and the fitting out of the new premises required clearance from the Department of Health. As time went on, Dublin Corporation seemed less certain the property would be made available and eventually the Department of Health decided that the property be included in the sale of the Richmond Hospital Complex instead. 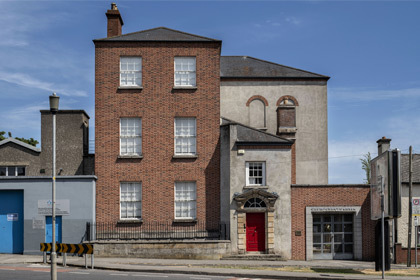 Representations were made by Liam Clare and Fred Donohoe from the Eastern Health Board and a lobbying campaign was mounted by the Management Committee to secure 4 North Brunswick St. for the project. This culminated in a street protest in Christchurch organised by Kate O’Sullivan an active member of the project and supported by Senator David Norris resulting in the then Minister for Health, Dr Rory O’Hanlon requesting that the Eastern Health Board, Dublin Corporation and his own department provide suitable accommodation for these 18 organisations. In March 1990, finally after many months of struggle and campaigning, the project moved into the former Doctor’s Residence of the Richmond Hospital called Carmichael House on North Brunswick Street. Kate became chairperson of the new organisation called “Carmichael Centre for Voluntary Groups” and subsequently the organisation’s first CEO. Carmichael was officially opened in November 1990. Demand for space continued leading to the first renovation project, the Gate lodge, which opened beside Carmichael House in 1994. Thereafter, Dublin Corporation made an offer to Carmichael for the use of Coleraine House. The former Chamberlain’s Residence in the Linen Hall on Coleraine Street was disused and in need of major repair. This fine listed building was then meticulously restored and opened in 2000. Carmichael House was subsequently refurbished in 2004. Today Carmichael is a national training and support body for the nonprofit sector providing services across the county. It continues to be a shared services facility for over 48 nonprofit organisations whose employees and volunteers tackle major social issues and provide invaluable direct and indirect supports to over 140,000 people. In 2017 the book “Carmichael House and Coleraine House: two centuries of serving a changing city” edited by Liam Clare was published by Carmichael.